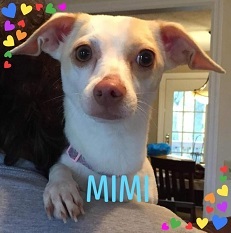 MIMI is a 1 yr old Chihuahua/Doxie (Chiweenie) who was an owner surrender to STAR Rescue in Kentucky. She is only 10 lbs, and friendly to all including kids & other dogs. She knows how to walk on a leash & is making progress with housebreaking. LOVE to share with someone who will cherish her forever. MIMI is precious…and would love to spend her life with someone who appreciates how special she is.